I have often wondered why someone has to come along and change the names of old landmarks that have stood for years. The new name prevails with the new comers and the old ones are lost in the dust of time, along with the old timers who named them. For many years the only road from the Safford/Solomonville area of Arizona to Clifton was called the “Convict Highway.” It wound its way up out of the Gila Valley and went over the mountains, dropping down to the Gila River and on into Clifton. What an improvement over the old pack trail that went in much the same area. This great engineering feat was done by convict labor with pick and shovel. It was started in 1914 and finished sometime in 1920. First used by wagons, the road was soon home to Model T’s. I can remember, as a small child, traveling over this road in our Buick Sedan, going to see Grandpa Gamble in Clifton. As my brother and I rode in the back seat, I can still hear the whining, grinding of the various gears and Papa honking the horn as we we began to make sharp curves in the road. My brother and I always watched the temperature gauge, away out on the front of the car, and wondered what would happen if it got to the very top. But, in those days, everyone carried a canvas water bag for this very purpose. To this day, I can still feel the “queasy feeling” of my stomach as I turned pea-green from carsickness, while my brother was barfing out the window on the other side. On these journeys to Grandpa Gamble’s, it was a tradition to stop and visit the “old convict” who was buried just off the road. I can remember, we’d walk around the area, gather up a few more rocks to place on his grave, and Papa would tell us about the old convict. This is the story my folks told us about the gravesite. It seems that the prison guards had a crew of prisoners out there working with pick and shovel on a hot summer day in 1916. All of a sudden, for some reason, one of the convicts bolted and ran. He was shot dead on the spot. The other convicts were made to dig a hole for their comrade, roll him off in the new grave and cover him up. This probably dispelled any notion of the other prisoners to bolt and run. 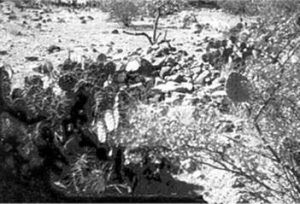 The first time I took my husband and children to see the gravesite; we saw a very strange thing – a cholla cactus had grown at the head of the grave. It was a tall, spindly thing about two and a half feet tall, with two arms that formed a perfect cross. I guess no one but the Good Lord remembers who he was, but the Lord had provided him a marker. Some fifty to one hundred feet from the convict’s grave is yet another burial plot. History has it, that the man got sick and died there. However, they were not buried side by side. 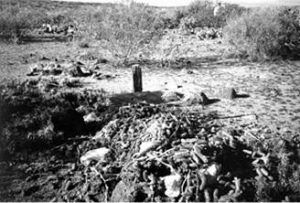 Both graves are in sad repair, cactus covered and rocks strewn about. We have plans for a picnic lunch and a little work down on that lonely flat. And now, for the change of the name of the Old Convict Highway, ah yes; now it is the “Black Hills Byway.” I guess it is more politically correct and so romantic sounding. Well, to me, it is still the Old Convict Highway. When I am gone, then you can change it! For seventy-five years I have wondered about this person who is buried here. After I was grown, I have asked questions of many people, written letters to the prison and nothing could I find. This year , my 80th year, with still dogged persistence and determination, I finally hit pay dirt. One day as I was “messing around” with my computer, I ran onto a website for the Arizona Prison System. I found records of many prisoners who were housed there, those who were executed, and even what they had for their last meal. In reading the information, I found that one might be able to find information on some of the prisoners who had been incarcerated, from the Department of Library, Archives and Public Records in Phoenix, Arizona. Immediately I thought of my “old convict” lying out there in that cactus infested flat. I wrote a letter to the library, explaining the situation, the area, and the year. I really didn’t have any idea or hopes that I would find out anything, but it was worth a try. In about two weeks when my husband brought in the mail, I was surprised to see I had a letter from the State Capitol Library. I figured it would be a “sorry, we couldn’t find any information” type of letter. To my amazement and joy, here was the whole story! Can read and write: Educated, catholic school, Mexico. Occupation: Miner and machinist helper. Pobre Pendejo, why did you run? By Nancy E. Brown, December, 2004. About the Author: Nancy E. Brown is 82 years young, and loves southwestern history. Her and her husband, Clyde, along with their family, love to tramp around old mines, ghost towns, abandoned houses, and cemeteries. Both she, and Clyde, at age 84, stay young by riding their 4 wheelers and spending their vacations at such places as Doubtful Canyon, Steins Peak and the Butterfield Stage Road. Approaching their 64th anniversary, Nancy and Clyde used to live in Arizona but now reside near Reserve, New Mexico. Over the years they have enjoyed numerous excursions in the southwest.